This is like a Christmas cake but not quite so rich. 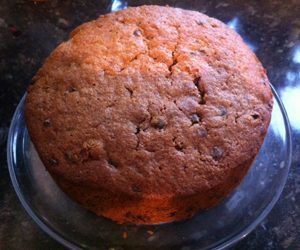 I bake one at the same time as my Christmas cakes – on Stir-up Sunday, the last Sunday in November, when traditionally people make their Christmas cakes, Christmas puds and mincemeat. You don’t have to wait till Christmas for this cake – eat it during Advent or even earlier. Quantities are approximate; the idea is that you’re using up leftovers from your Christmas baking. You’ll need an 18cm loose-based cake tin. It’s important to prepare your tin thoroughly – if you don’t, your cake will be dry. Line the base and inside with greaseproof paper, double thickness. Line the outside with brown paper and fix the lining in place with sticky tape. Cut a circle of brown paper to make a lid for your cake tin. Preheat your oven to 150°C, gas mark 2. Now for the easy bit: mix everything in the order given (but not all together in one go). Add a tablespoon of water if the mixture is very stiff – it should be quite firm but easy to spoon out. Spoon your cake mix into the prepared tin, cover with the brown paper lid and bake for 2 ½ to 3 hours. Take the brown paper lid off after 2 hours. Test to see if the cake’s done after 2 ½ hours – put a metal skewer into the cake; if it comes out clean the cake is done. Another way to check that it’s done is to listen for a ‘singing’ sound in your cake. If it’s still burbling away it’s not ready. But don’t worry – this is an adaptable cake. A few minutes too long or not long enough won’t matter. Leave the cake to cool completely before taking it out of the tin. You can eat it as soon as it’s cool or hide it away to mature for a few days.